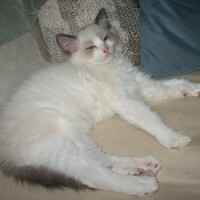 The Ragdoll cat comes in very specific patterns and in various pointed colors. 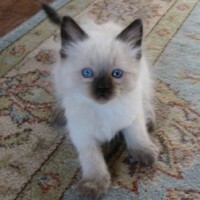 Ragdolls are blue-eyed pointed cats. 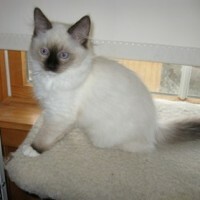 The definition of a pointed cat is one with darker pigment on the extremities. The color is actually temperature-sensitive, so it gets darker on the cooler parts of the cat, which is its extremities. With Ragdolls, white may overlay some of the points in certain patterns. 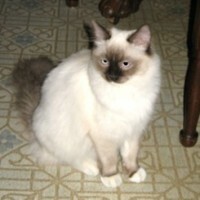 Other blue-eyed, pointed breeds are the Siamese and Himalayan. Blue – steel gray on the points and lighter gray on the body. Seal – dark brown on the points and light tan to light brown on body. Lilac – lilac or pinkish tone of gray on points and milky white on body. Chocolate – milk chocolate color on points and ivory color on body. Red (Flame) – orange color on points and a creamy color on body. Cream – pale creamy peachy color on points and white on body. 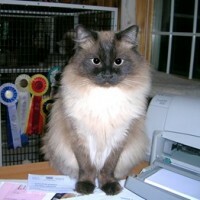 Tortie – tortoiseshell on points, creamy color on body. 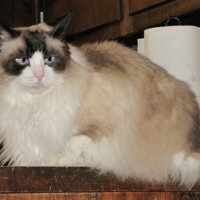 The Ragdoll comes in three patterns and all three can come in lynxpoint. 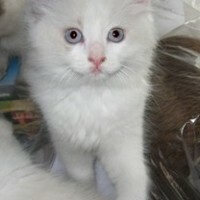 Bicolor – bottom half of cat is white; white legs, white belly. 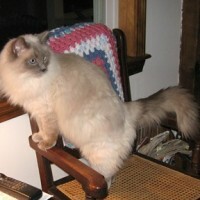 Face has a white inverted V.
Mitted – cat has white mittens on front feet, white boots on the back, white chin, white chest with white line running down the belly. Can also have a white blaze on the face. 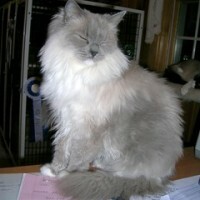 Colorpoint – cat has no white on it. Its feet, face and tail are all the darker point coloring. 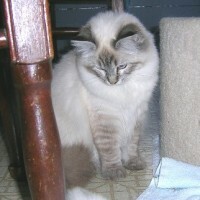 Lynxpoint – the cat has tabby striping overlaying the points. 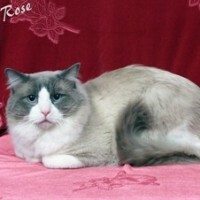 Below are pictures of the patterns and colors available here at Foss Mountain Ragdolls. 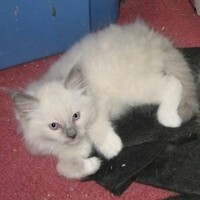 You’ll see an adult cat in mature coloring and what it looks like as a kitten. 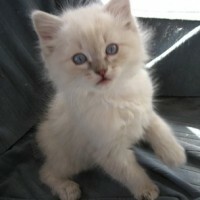 Kittens are born white and their coloring comes in over time. They do look quite different as kittens! Click photo for a larger view. Website, all content, photos Copyright © 2010-2019 Foss Mountain Farm. All Rights Reserved.